Services will operate with four coaches with carrying capacity of around 570 passengers at an interval of every 15 minute. After years of delays and overcoming many a operational hiccups, the country’s first Monorail finally made its debut with Chief Minister Prithviraj Chavan inaugurating the service. The commercial operations of the 8.9-km first phase connecting Wadala-Chembur stations on the northeastern fringe of the megalopolis commence on Sunday with the first train leaving the Wadala station at 7 AM. The Rs 1,900-crore section is expected to ferry around two lakh passengers a month and will supplement the suburban conventional train network across the metropolis. The Rs 3,000-crore project is being implemented in two phases. In the second phase the services will be extended to Sant Gadge Maharaj Chowk in south Mumbai. 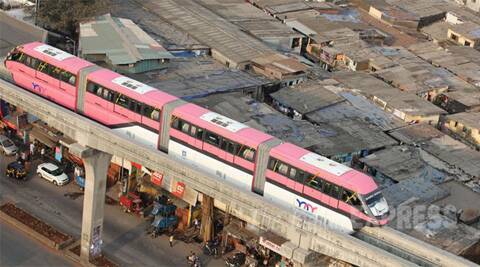 The Mumbai Metropolitan Region Development Authority (MMRDA) who owns and operates Monorail has fixed fares between Rs 5 and 11. To begin with, the services will operate with four coaches having a combined carrying capacity of around 570 passengers at an interval of every 15 minute. MMRDA has already spent Rs 1,900 crore of Rs 3,000 crore allocated for the project including on the civil work for the second phase. The authority plans to extend the train to six coaches and scale up services frequency to at every nine minute and further to four minutes going forward with six coaches. “…In fact the Mumbai Monorail is not just first in the country but across the subcontinent. Monorails are in operation in China, Japan, Singapore, Australia, Dubai, Europe, and the Americas”, the chief minister said. The Monorail, a light rapid transport system, is set to change the way Mumbaikars travel as access to its air-conditioned coaches will be through smart-card tickets, lifts and escalators at overhead stations. The service will be thrown open to public for regular commuting from Sunday. The monorail is being executed by a consortium of engineering major L&T and Malaysian firm Scomi Engineering. The service will reduce the travel time between Wadala and Chembur by almost half, from 40 minutes to nearly 21 minutes. “One of the projects is complete now and another project may not be complete before the elections but there will be no compromise on safety whatsoever,” he said. On the metro project, Chavan said when the agreement between MMRDA and Reliance Infra was signed, there was a clause which specified the provision for arbitration in case of any dispute or change in required. On the disputes between his government and RInfra on naming and pricing of the metro services, Chavan said he suggested to the Centre to form a dispute redressal mechanism at the national level to resolve any sort of disputes arising in any kind of BOT projects. “I have urged the Centre that for all the BOT projects have be a dispute resolution mechanism. It could help in resolution of any sort of BOT disputes like toll, railway or the metro,” the chief minister said.